The winners of the voting for the 2016 BGG Golden Geek awards were just announced. We’ve been talking about the winners amongst ourselves – and we thought it would be interesting to bring this discussion to the blog. The Golden Geek Award is given annually to the best new games of the year, as selected by you, the users. In order to avoid voter fraud, we have adopted the following restrictions. Voting is restricted to either supporting users (having a supporter badge from any year is sufficient),voters who pay a one-time 20 GeekGold fee, or users who have purchased an avatar or a geekbadge. First, there will be a nomination phase. Each eligible voter can nominate up to 10 items in each of the categories. The 10 items with the most nominations in each category will become the nominees for the final voting. You are not restricted to the list of suggested nominees. For those who don’t want to read the specifics of the system, users will rank the games in each category from 1 to 10, (with a 0 for no opinion), and, through some mathemagical computations, we will select the winner. So, these awards represent a sort of People’s Choice awards, chosen by the userbase of BGG themselves… I will list many of the different categories below and then there will be space for the OG writers to comment as they wish. Lorna: Played all three. I’ve played Terraforming Mars the most. Mars has been interesting enough to play a few times but I’m starting to get a bit tired of it now. I also didn’t care for the “take that” cards. Scythe was ok, it’s a solid game just didn’t really grab me, nothing really innovative just Ameritrash/Post apocalyptic art and cool minis. I liken it’s popularity to Lords of Waterdeep. Rebellion I’ve only had time for one game. I think I might like Rebellion but I need another play. Again nothing innovative but lots of plastic. Since I tend to like Euro style more I preferred Yokohama, Great Western Trail and Lorenzo the Magnificent. Dale: Wow. I feel like I play a lot of games, and this year I don’t seem to match up well with the BGG users! Taking the Game of the Year list – I have played Scythe and Terraforming Mars once each. Neither caught my eye and I haven’t really looked for a return play of either. I was a bit turned off by the swingy-ness in the TM cards, though I know that I may have just gotten a weird draw in my only play – but, the variance was outside of my comfort limit for a game of that length. And, as I was not impressed by Scythe, that puts me at odds with what feels like half of the awards listed here! Larry: I didn’t think the results were too surprising. After all, Scythe is the #6 game on the Geek. I thought enthusiasm for it might have dimmed a bit in recent months (it certainly has for our group), and that something like Great Western Trail or Terraforming Mars might have overtaken it, but it’s still far from a shocking win. Unlike most KS games I’ve played, it’s actually pretty well designed and developed and it’s got those minis working for it. So not a result I’m surprised at or particularly displeased with. Personally, I think Scythe is good, not great. The balance feels a bit wonky (some combinations of race and abilities seem to work better than others) and it can overstay its welcome, but it’s a solid game. I like Terraforming a lot, even though the “take that” cards bug me–they feel bolted on, as if in response to complaints that there wasn’t enough player interaction, and don’t always reel in the leader. But it’s one of my favorite games of the year. And I haven’t played SW: Rebellions–it doesn’t really fit my player profile or my way of usual way of playing–but there are several members of my group who really love it. Greg S: The people populating BGG have changed drastically over the past several years, so much so that my tastes rarely align with those folks’ preferences. I can see the same thing in our own East Tennessee Gamers group, as we have had an influx of folks whose tastes lean more towards American-style games versus European games. I do notice that most of these folks (at least in our group) are significantly younger. Perhaps their taste in boardgames has been influenced by their growing-up in a video game culture. I have played Scythe just once and while I enjoyed it, I wasn’t caught up in the rapturous ecstasy that greeted the game’s release. I do want to play it again, but feel no pressing urgency to do so. I can say much the same about Terraforming Mars. I’ve only played once and felt it was a solid game, but have felt no big urgency to play it again. I may actually enjoy it more now that I understand it a bit better, so I should give it another go soon. 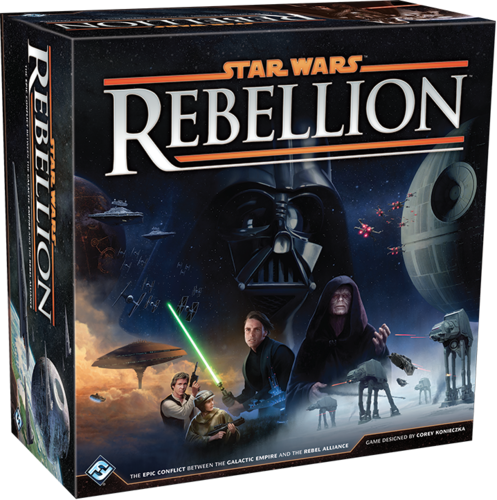 As for Star Wars: Rebellion, I’m going to risk being labeled a heretic by stating that I am not a Star Wars fan. The series lost me when the teddy bears (aka, Ewoks) defeated the Empire. C’mon, give me a break. So, I have had no real desire to play any Star Wars themed game. Further, I rarely play 2-player games, so this was another strike against the game. I have heard it is a very good game, though, so I may well be missing out on incredible gaming goodness. Craig M. – I’m not surprised by results. I view the Golden Geeks as equivalent to the People’s Choice awards and popularity contests. I’ve played both Scythe and Terraforming Mars several times (the latter has been played almost ten times). I’m not a huge fan of Scythe, but I’ll play it if asked. I find a lot more to like with Terraforming Mars, especially if all of the advanced rules are used (draft, corporations, etc.). Frankly, I think it is a better game than Scythe. It feels much of the love directed towards Scythe is from the art and miniatures. I haven’t tried Star Wars: Rebellion yet. Doug G. – Shelley and I played both Scythe and Terraforming Mars, but not Star Wars: Rebellion. The former titles were both in our top 5 for 2016 and Scythe made #1 on both or our lists, so it seems that we concur with the BGG vote. We loved Scythe’s variance of choices depending upon the board each player receives. We did have one game that was very lopsided due to a killer combo of board and faction power, but otherwise we love the game and see it hitting the table often. Terraforming Mars became an obsession for us for a couple of weeks, as Shelley requested a rematch often. The drafting variant mitigates some of the card combo problems and allows for more interaction as players deliberate whether to pass along a card they know will work for their opponent(s) or take the card for themselves. Both have our strong recommendation and I was glad to see them in the top 3. But, perhaps as a result, I’m not bothered by BGG’s choices, any more than I am by any award choices. They certainly look like an entirely reasonable fit for BGG, even if they aren’t for me. Nathan Beeler: As of now I’ve only played Terraforming Mars, and that a few times. I like the potential in it, and it’s certainly one I’m happy to keep trying. I may even buy it someday, despite some nits I could pick like the sometimes strangely arbitrary endgame scoring options. We have borrowed a copy of Scythe that I have read the rules for and hope to play soon. I have some tentative excitement for it, along with some trepidation. Namely, I have a huge problem with multiplayer games that have targeted aggression, which is why I’m only going to play it as a 2p. Furthermore, cool minis will not mask an otherwise meh game for me (though they are pretty cool). Time will tell. Tery Noseworthy: I’ve played Terraforming Mars only once, but I enjoyed it. I didn’t experience some of the imbalances others have talked about, but it’s hard to say after one play. I look forward to trying it again. I’ve played Scythe several times and I really enjoy it, although I have only played it 2-player. I think this game suffers a bit from unreasonable expectations; it was so hyped beforehand that some people are inevitably disappointed when they play it. It is a solid game with some interesting mechanics. I haven’t played Star Wars: Rebellion, but I’d like to. Eric Edens: I have played all 3 of these but by far more plays have been of Terraforming Mars. I have played the game in the 30s of times if you include solo. I like it a lot and played it more than any other game last year which if you consider it can be a 3 hour game that is crazy. I think it was my favorite game and I do know it has flaws. If you don’t play with drafting I think you can see the game as swingy. And if you do play with drafting you really can’t be the new guy as your corporation choice is vital and can make or break your fun. But I like engine building games and going from being able to do one action or buy one card to get to do a ton of stuff and have a bunch of cards in front of me at the end is awesome. Scythe I have tried many times and I like it but it didn’t live up to the hype I had for it. It was a top 5 for me but wasn’t my favorite. It has some issues based mostly around if you play with aggressive players and who is next to you. But it looks great and has a great fun factor. I disliked my play of Rebellion. I want much more to just play Star Wars Risk and have the die roll for victory come at 35 minutes into the game instead of 3 hours. I felt it was great in making me relive the movies but too much luck in too long of a game for me. Michael W: I’ve played Scythe a handful of times and enjoyed each play, but it’s not an all-time favorite. The change-up in player board and special ability keeps it fresh enough, and I do look forward to trying it with expansions. TM gets better as you get to the “real” rules. Without corporations and initial card costs, it was bland. Without drafting, it’s better to leave out the “take that” cards, and I’m very much looking forward to a full play with experienced players and the proper draft rules. SW:R is high on the to try list now, based on the discussions spurred by the Geek awards. Chris Wray: Congratulations to Stonemaier Games. Scythe captured the hobby’s attention in a way that few games do, and the designers deserve enormous credit. But to take this a step further, I’ll add that there are other forces at work. Scythe, to me, was okay but not great, a game buoyed by this hobby’s over emphasis on miniatures and victimhood to the endowment effect. This seems to be common with Kickstarter games: people buy the games before they play them, and then psychologically they end up saying that they love it because they’ve invested so much darned money in it. Mechanically, Scythe was pleasant enough, and it was better than the vast majority of Kickstarter games, but I have a hard time believing that it is nearly as good a game as Puerto Rico or Agricola. Scythe feels like more of a passing fad than an evergreen, and the current BGG membership has trouble telling the difference between the two at first, even if they eventually get it right (and we’re already starting to see average ratings fall for Scythe). Rebellion, as a game a lot of people could try before they buy, likely doesn’t benefit as much from the endowment effect. But once again, add in miniatures and you get bonus points — way more than I would say is rational — on BGG. And it benefits immeasurably from the Star Wars intellectual property. Tear away the Star Wars IP and this wouldn’t have cracked the top 500 games, let alone the top 20. Like Greg, I’m not a fan of Star Wars, so the game had limited appeal. But I tried it anyway, and I wasn’t impressed. The combat system was wonky, so much so that I was left to question why Fantasy Flight ignored a 30-year trend of streamlining games. Terraforming Mars is, of course, the exception to my curmudgeonly comments. I liked it when I reviewed it a few months ago. The production value was fine, but not spectacular. Of the three nominees, it is the game I would have most liked to have seen win. It is the game that seemed to have worked best mechanically, and I had it in my Top 10 of 2016. Scythe may have won the People’s Choice Awards, but I just don’t think it has legs in the critics’ choice awards to come. Same goes for Rebellion. Terraforming Mars might, but I think it’ll face competition from Great Western Trail, A Feast for Odin, and some other Essen 2016 releases. Lorna: Only played Rebellion. My winner was Hanamikoji. Larry: I rarely play 2-player games these days and it showed, as I have no experience with any of the nominated games. Greg S: See my comments above about Star Wars: Rebellion. As mentioned, I rarely have the opportunity to play 2-player games, so this category is one in which I take little interest. Matt C: The Arkham Horror theme does not interest me, but I am fond of the other two themes. I don’t get heavy 2p games to the table very often so expect to get the most play out of Hero Realms. As a co-op type person, I’m most interested in the campaign mode so don’t plan to make a hard judgement call on the game until I try out that mode. Craig M: How Hanamikoji didn’t crack the top three is a mystery to me. See my comment above about the People’s Choice awards. Craig V: Again, haven’t yet played Star Wars: Rebellion Runner Up, Arkham Horror: The Card Game, or Hero Realms, but I don’t play very many 2-player games in general and didn’t actually play any of the nominees. The only one of these that I have played is Arkham Horror: The Card Game. 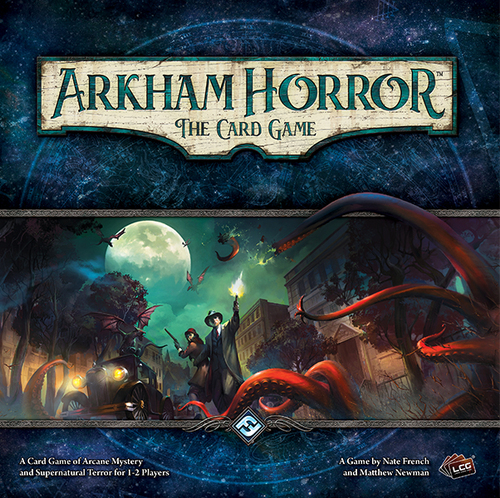 I am a fan of both Arkham Horror and Eldritch Horror, and this does a good job of keeping the feel of these games in a 2-player card game that has less set-up and plays faster than the board games. Eric Edens: I haven’t played Hero Realms. Like above I didn’t care for Rebellion. But I like Arkham. I just don’t see it as a 2 player game. I know it can be but I play it solo. So to me I just don’t have it in this category for me. My favorite 2 player is Hanamikoji. It should have won. If nothing else at least been in the runners up. Too few players I guess. Michael W: Hero Realms is decent, different enough from Star Realms once the character cards are incorporated as they each lend themselves to a different strategy. Chris Wray: Fully agree with Craig M.: how Hanamikoji didn’t crack the top three is a mystery to me. I think maybe not enough people played it? Dale: Interesting – I can go with Scythe and MvM here. I thought the art in Inis was certainly different, but the overall graphic presentation seemed cluttered. If anything, the layout seemed to get in the way of gameplay. But – with art more than anything else, it’s all subjective. Larry: Scythe was my pick as well, although I don’t know that any game particularly blew me away with its appearance this year. For Scythe, the artwork is a bit uneven, but overall quite nice; the real star is the design and execution of the indented player boards, which is a brilliant solution for what could have been a very messy mechanism. 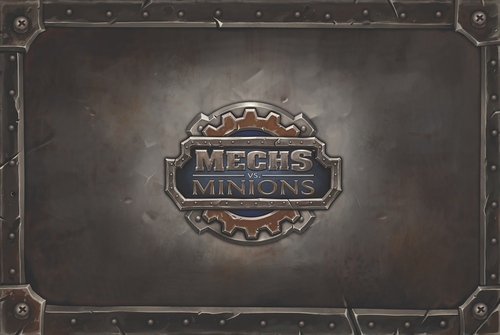 Matt C: No copy around here, but I’m looking forward to giving Mechs vs Minions a try. I like the theme, mechanics, and cooperative play so I am expecting MvM to be a win for me. Craig M: No surprise that Scythe won. It is a visually interesting and appealing game. Doug G: I purchased the deluxe version of Scythe and am glad I did. The hardcover book of art is wonderful. The player boards with the double-thick cardboard and indentations for the cubes make me VERY happy. I had to go out and purchase a similar overlay so that Terraforming Mars had the same feel. Joe H: I must admit, I’ve been far more taken watching Mechs vs. Minions than Scythe (I’ve played neither), though I can see the appeal of both. Craig V: Scythe definitely has an evocative cover, but I’m not sure if the look was maintained throughout the game and its components since I haven’t played the game (and probably won’t). I really like the look of Kodama (one of the other nominees), but haven’t played it yet either. Eric Edens: I agree with the ordering of these 3. 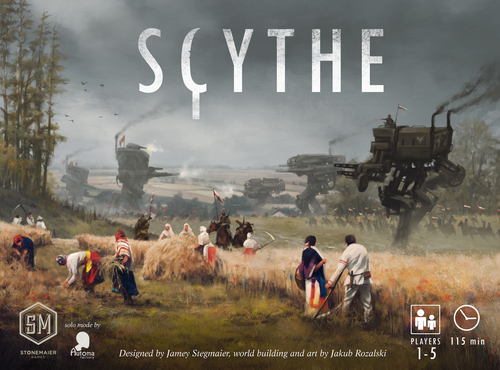 For me Scythe did the best artwork combined with presentation. MVM had the best presentation and Inis the best artwork. So I feel fine with the order and winners. Michael W: The sheer genius of MvM’s storage inserts puts it past Scythe for me. Both are very attractive and well produced and show where games can really go when art and presentation are not just afterthoughts to design. Chris Wray: Though I’m not the biggest fan of Scythe — and though I actively detest Mechs v. Minions — they were fair winners for this award. Scythe is beautiful, as is the production value on Mechs v. Minions. Though I liked Inis better as a game, production wise it didn’t measure up to the other two. Runner Up – Sushi Go Party! Mark Jackson: I’m glad to see Clank! get this recognition – it’s a perfect blend of deck-building & board play… and I’ve already played it 10+ times in 2017. Larry: This was the only Golden Geek category I was truly disappointed in. I thought there were a bunch of interesting and well regarded games that didn’t even get nominated, like First Class, the Coal Baron card game, the Power Grid card game, North American Railways, Codename: Pictures, or Insider. I was particularly surprised to see First Class get a Strategy game nomination, but not a Card game one. Do people not think this is a card game? It was billed as the Russian Railroads card game! I’m not sure it would have made a difference (the Arkham Horror card game was probably always going to win), but it showed there might be a strong disconnect in how I view card games and the rest of the Geek does. Seems as if folks are looking for things more thematic and CCG-ey than I require, as opposed to the “boardgame with a deck of cards” (or just straight card games) that I like. Of the 15 nominated games, I’ve only played 3 of them, despite playing a lot of card games. Honshu would have been my pick from them–it’s pretty good and has interesting decisions, even if great cards just sometimes fall in your lap. I’d play the Castles of Burgundy card game and Fabled Fruit again, although both were dangerously close to being “meh” for me. I haven’t played the AH card game and probably never will–just not my kind of thing. I enjoyed Sushi Go in the past and would probably like Sushi Go Party if I had the chance to try it. Clank might get a future play, but it won’t kill me if it never does. Dale: Though it truly pains me to agree with Larry (and/or admit that he’s right) – Honshu would have also been my vote here. I’ve been meaning to play Clank! – but I just haven’t been around a copy yet. I am hoping that I’ll get a chance to play it at the Gathering of Friends. Lorna: Haven’t played any of these, just regular Sushi Go. My favs this year would be Wind the Film and Hanamikoji. Honshu gets an honorable mention. Terrifying Girl Disorder is kind of a cool drafting game but I haven’t played it enough to make it a favorite. Sly Knight Robbery is deceptively simple but also interesting to play. Matt C: I’ve played regular Sushi Go and liked it, I’m expecting to find Sushi Go Party! to have a similar feel. Still don’t care for the AH theme. I’ve played Clank! and think it is much more interesting than Thunderstone or Ascension (which I feel it sort of combines with a nice board interaction.) I was somewhat burned by player order cards in hand, and up for purchase, etc… in my first game so am wary of playing Clank! again (I know I could have made a couple better decisions, but I’m not sure that would have been enough to win.) I’d play again but not suggest it. Craig M: Good to see recognition for Clank!. It is the first deck building game I have really enjoyed in a long time. Like Larry though, I’m surprised some excellent card games didn’t get recognized. First Class, Honshu and Power Grid the Card game being the top of my list. Also, this is a category that is hard for me to define. Clank! is clearly a card driven game, but needs a board. What about Terraforming Mars? That game is all about the cards and has a board. This is a category that feels really poorly defined. Doug G.: Sushi Go Party is a wonderful redo of the original, incorporating a scoreboard that holds tiles with brief summaries of the various cards and how they score. With new card types and the ability to play with up to 8 players, this one will be a school favorite for years to come. 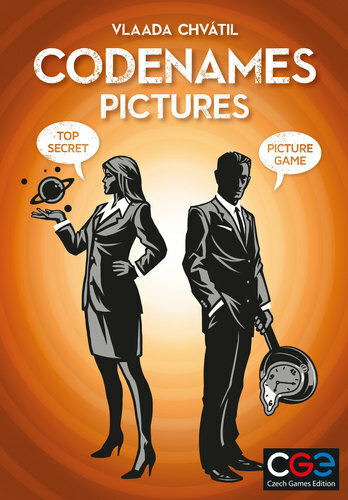 Codenames Pictures is my other favorite from the category, and I’ve found it working better than the original with some groups. I haven’t played either Arkham (not our type of game) or Clank! (interested, but I’d have to work to get Shelley involved). Joe H: I half agree with Larry – I don’t consider either First Class or Power Grid: The Card Game to be card games, but I do think there are other games which are clearly card games which might have been better choices – if they’d achieved the level of exposure these games have managed. Craig V: Not having played Arkham Horror: The Card Game or Clank!, I would have picked either Archaeology: The New Expedition and The Castles of Burgundy: The Card Game, although the former is just a revised version of the original Archaeology: The Card Game and the later is a reworking of the existing The Castles of Burgundy board game. Therefore, my vote was for Honshu as it is a very simple, yet unique game that is interactive and has depth. Nathan B: Clank! was a pleasant surprise for me. Nothing terribly novel that I could see, but it did a nice job of using existing mechanisms to evoke the proper mood and not overstay its welcome. I’ve not played the other nominees here, but there are many fine card games from this year, like Power Grid: tCG and First Class, that it would be tough for me to pick a true favorite (or even really understand what defines a card game). Eric Edens: I like Arkham a lot so this win to me is fine. But I think Power Grid the Card Game should replace Sushi Go here. I really liked how it took my favorite parts from the originally and dropped what I didn’t like. I may be in the minority but that is my opinion. Clank! I got introduced to late but it was good. Deserves where it stands and I hope more people expansions come. But Aeon’s End should be somewhere here. Michael W: Agree with Eric that Aeon’s End should be in here, but my personal choice would have been Clank!. It’s a great blend of light fun with decent decision/strategy elements and never lasts too long. Chris Wray: I fully agree with Larry. I would have rather seen this go to First Class, Power Grid: The Card Game, Codenames Pictures, etc. I’ll be fascinated to see how this list stacks up against the A La Carte award. Dale: Though I still haven’t ordered a copy for myself, I do approve of the co-operative winner, Mechs vs Minions. I had a great time with my initial games in the system, and I’m looking forward to playing it more in the future. I’ll admit that the minis don’t really do much for me (in general), so my love of the game is about the game itself and not the bits. I’ve personally had a lot more enjoyment from Aeon’s End (which I think would have been eligible for this award). Lorna: Haven’t played any of these yet. My choice was Pandemic Iberia even if it’s kind of not new. Larry: Cooperative games? What are those? :-) Actually, I did play one of the nominated games, Star Trek Panic, which is pretty good and actually fits the Star Trek theme better than the original Castle Panic theme. But, man, is it hard! Greg S: I played Mechs vs. Minions only once and we lost very quickly. Thus, I probably didn’t get a true experience of the merits of the game. I’d play again, but the theme doesn’t grab me. As far as cooperative games go, all pale in comparison to Pandemic: Legacy, so a game truly has to shine in order for me to take notice. Of all the ones I played last year, Pandemic: Cthulhu was my favorite, probably because I am a big H.P. Lovecraft fan and really enjoy Pandemic. Marrying the two was bound to catch my interest. Matt C: Despite being a diehard cooperative game fan, I haven’t played any of these. I like the Mechs vs Minions theme (I’ve played League of Legends a fair bit) and the mechanics (RoboRally gets lots of love at my house) the minis will be neat for my boys. I’m fine with MvM as the winner, but agree that Star Trek: Panic is a great implementation of the Panic theme and I would have been happy to see it at least get a runner-up. Craig M: The only game I’ve played in this category is Mansions of Madness. I enjoyed myself, but I don’t have a significant opinion here one way or they other. Craig V: I haven’t played Mechs & Minions, the second edition of Mansions of Madness, or Arkham Horror: The Card Game. My pick for 2016 was Aeon’s End which is a really great cooperative deck building game that feels different every time I play and so I always look forward to playing it again. It’s a great challenge that’s fun to play and has a lot to discover. Eric Edens: No complaints on this but wish Aeon’s End was here too. It’s a great game with what seems like little to no buzz if these awards are to be believed. Michael W: Totally agree with this one, as I’ve enjoyed every play of MvM. Played Mansions once and enjoyed it as well. Chris Wray: I’ll admit a bias here: programming games rarely work for me. Mechs v. Minions was no exception: I found it chaotic, and like some other winners in other categories, I suspect this was overly buoyed by the production value and branding. I would have gone for either Pandemic Iberia or Pandemic Reign of Cthulhu. Lorna: I’ve only played Pantheon. It adds a bit more to Duel which I find just ok. My choice here was the Targi expansion. Expanded the game and added nice new touches to an already excellent game. 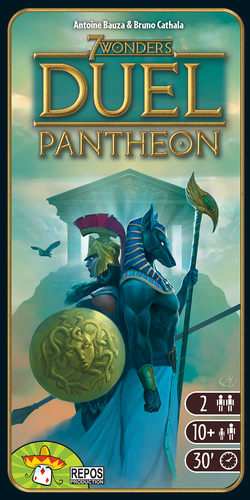 Mark Jackson: Pantheon was an excellent choice – I like how it added depth to an already excellent game without overwhelming the base game. Larry: I agree, Pantheon is excellent and was a very good choice. The only other nominated expansion I’ve played (I play very few expansions) was Orleans: Handel & Intrigue, which had some good and bad points. I might prefer the original game. Greg S: Expansions are evil. Period. Joe H: Really, truly evil. Matt C: The Orleans: Invasion expansion was what got me to give Orleans a try. I was interested before, but was motivated when the expansion provided a co-op mode. As a game, Orleans is pretty good, but the cooperative mode in Invasion is extremely innovative. Orleans feels like a very solid Euro and adding in a cooperative option makes it unique among strong Euros. Something that may be overlooked in the co-op option, it allows players to specialize in just a few strategic options whereas players normally need to get “a little of everything” to win in the competitive game. The solo options in Invasion are nice, but I am so much more likely to play boardgames on my tablet or computer if I’m playing solo. As for other expansions, I did get to play XCOM: Evolution. It isn’t needed, but for fans of the game it adds a bit more flavor through the Exalt tokens – players now have powerful new options that come at a price. I found weighing the risks vs rewards of the new Exalt powers a nice addition if playing with experienced players. Craig M: Nothing to add here other than I’m very much looking forward to 7 Wonders: Pantheon. Craig V: I no longer purchase expansions, but would have picked Cacao: Chocolatl. However, it wasn’t one of the nominees. I don’t actually own it and won’t be buying it because Cacao is great game as it is without any expansions! Eric Edens: I have only played Prophecy of Dragons here but it is my favorite part of Time Stories so I think it deserves a place here. Need to try the rest of these. Chris Wray: Pantheon was a brilliant expansion, and I think it was a fine pick for the award. Like Craig V. I think Cacao: Chocolatl would have been a good pick. Prophecy fo Dragons is my favorite T.I.M.E. Stories scenario, though I know it is a love-it-or-hate-it scenario, so I was happy it won. Lorna: I’ve had fun with all three of these. Mark Jackson: I have a lot less fun playing Pictures – I’d much rather play the original game. Dale: I really liked Quadropolis. It would have been my choice for winner. I loved Codenames: Pictures when it first came out, but like Mark, I would prefer to play the original now. The main reason is that the clues seem to be more constrained with the pictures. The picture form is definitely more accessible to younger players or less game-y folks… but you just don’t get the awesome clever wordplay clues with the picture form as you do with the plain word form. Larry: Completely agree with the group about Codenames: Pictures–I much prefer the original, for pretty much the reasons Dale gives. Still, Codenames is so awesome that even a lesser version of the game is worth playing, so I’m not too disappointed with this result. Imhotep and Quadropolis are both decent games I’d play again, but neither thrilled me. My pick from the nominees would have been Cottage Garden, which has more interesting decisions than you’d first think and which plays well with 2 or multiplayer. Greg S: Like Mark, I much prefer regular Codenames versus Codenames: Pictures. Still, I can readily see how it is a popular family game. I do enjoy Quadropolis and have played it quite a bit. It would have been happy if it had won the award. Matt C: Following the crowd, I like Codenames better but acquiesce that Codenames: Pictures brings the game down to a younger level. Craig M: I like Codenames: Pictures well enough, but probably do prefer the original. I really enjoyed Quadropolis as well, but it sort of came and went last spring and summer and has fallen out of rotation and the collection. It’s still very deserving though. Joe H: I think it’s telling that my wife’s family – not gamers – who have all been taken by Codenames, have not been thrilled by Codenames Pictures and have switched back to the original. I do see Dream Home as an obvious, missing choice here. Craig V: I am clearly in the minority here, but I strongly prefer Codenames: Pictures over the regular Codenames, especially for casual/family play. I liked Codenames, but felt it was too thinky and too long. It was fun when playing with gamers, but felt more cumbersome and frustrating when trying it with casual friends and family players. Therefore, I had initially ignored Codenames: Pictures until having the opportunity to play it with a bunch of friends during a weekend getaway. The pictures part seemed to make the game more approachable for all and I really enjoyed the experience. The game just felt more casual and FUN, not to mention a bit shorter overall. ALthough I do really like Codenames: Pictures (enough that I actually own a copy! ), I don’t think it is a great family game. Even if this category was labeled “Casual Game” I’m still not sure either Codenames is a good fit since both are far more exciting and engaging with at least 6 or 8 players… As for the runners-up, Imhotep was too mean and Quadropolis was too mechanical and boring. My vote for best family game was Animals on Board followed by Ice Cool. Animals on Board has a great theme, simple rule set, engaging game play, and fun artwork. It’s a game that will be played for years to come. Nathan B: I’ve played Imhotep a couple times, though I found it completely unmemorable. Codename: Pictures, also left me mostly cold, though I was, as most were, a huge fan of the original. I’m honestly getting to the point where I cringe when people pull either out, now. I’m a party game fan, and there are so many good ones to choose from. No need to obsess on one. I will echo what Craig mentioned above, that Ice Cool is a pretty stellar entry in this category this year. Eric Edens: Ice Cool should be on here and I think it just comes down to buzz. It didn’t get any until late and not enough people have played. I felt Imhotep was very mean and I didn’t like it as a family game. Codenames Pictures is a downgrade for me from Codenames but still a great game set. I didn’t care for Quadropolis at all. Chris Wray: I actually really like this list, but family strategy games are sort of my niche. All three were fine choices, although Quadropolis didn’t capture my attention as much as the others. I’d add that Kingdomino — which is one of my leading predictions for the SdJ — would have made a fantastic pick. Same goes for Fabled Fruit. Lorna: While it didn’t feel that innovative Captain Sonar is a lot of fun. Larry: I actually think Captain Sonar is pretty innovative–it was my #2 pick. Scythe was #4 and fits the bill reasonably well (with the way that the top and bottom actions work being the most innovative aspect). I hate Vast with the searing hate of a thousand suns. Honestly, my one (and ONLY) play of it was one of my worst game experiences of the past 10 years. My pick for Most Innovative was Fabled Fruit; even though the gameplay didn’t thrill me, I think the idea behind it is very clever. And I’m a little surprised SeaFall didn’t get more love; maybe that’s a reflection of some discontent about how it plays out. Greg S: I have played Captain Sonar several times and it has two major features that I tend not to enjoy: real time and pigeon-holed roles. It has proven popular with just about everyone with whom I played, so I’m just the oddball. Innovative? Perhaps. Matt C: I love Captain Sonar so am happy to see the win. It feels much like other real-time games with special roles (Space Cadets: Dice Duel, Dr. Panic, etc…) although I admit the roles here are different than in those other games. So, innovative, but perhaps not that innovative? I’m sure someone will point another example out, but I still think the Orleans: Invasion cooperative mode was pretty innovative. 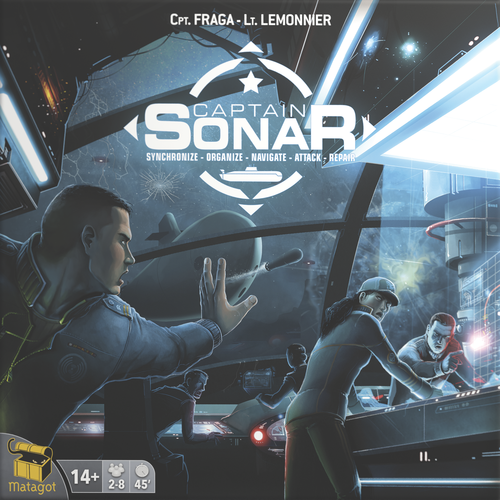 Craig M: Somehow I missed Captain Sonar, but based on my understanding, it looks and seems innovative and different. I guess I’m missing the innovation in Scythe which really a Euro style game in Ameri-trash clothing. Not seeing anything innovative in the mechanics there at all. Craig V: Again, I somehow haven’t played any of the top three games for the category. Of the nominees, my picks were Millennium Blades because of it’s unique theme and it’s ability to capture the entire CCG experience in a single game and Mystic Vale because of its card-crafting mechanism. Nathan B: I was going to ignore adding to this whole topic, because I care about BGG awards as much as I do about those given out for games most appreciated by German families. It just doesn’t move the needle. But after seeing this category and the comments of others, I was spurred to action. I had an incredibly similar experience with Vast to Larry’s painful play, and I echo his hatred. It is an innovative game, undoubtedly, and I have no problem with it being nominated for this category. In fact, I’d say it’s more innovative than the winner, which was also something newish, even if just gamer Battleship. My one and only play of Vast was simply brutal. I don’t mind the idea of everyone playing by different rulesets (full disclosure: I tried to implement a similar idea in one of my prototypes years ago), but given that nobody knew what anyone could do or why we’d want to do the things we were told we could do, it was just five people flailing around for the eternity it took to finish. When we did figure it out, the game boiled down to whack the leader. Ugh. We all cheered when it was over. Millennium Blades is also an interesting choice here, as it’s chock full of new ideas and it also wasn’t a game for me. Funny, I claim to like innovation in game design. Eric Edens: Not sure I felt Captain Sonar was innovative. Fun game but not in my tops for this category. Vast being so different is why I see it as a winner here even if execution to me wasn’t the best. I want to encourage more games to play so differently by which character or setting. Chris Wray: I don’t like real time games, so I’m disinclined to like Captain Sonar, but I still thought it was a fine game. And like Larry, I did think it was innovative. I utterly fail to see how Scythe was innovative. It felt like a mashup of Euphoria and Terra Mystica. Like Larry, I think Fabled Fruit should have been a top contender. Larry: Codename: Pictures and Captain Sonar were my second and third picks, so no disappointment there. Haven’t tried Secret Hitler. My top pick was Insider, which, though fragile, is a lot of fun when it works. I think some simple house rules about picking a good secret word would help it a lot. Matt C: I like Captain Sonar better than Codenames: Pictures, but Captain Sonar takes a big ding because it is best only with very specific numbers of players. Craig M: Sure, more Codename in whatever form is great. Craig V: Of the nominees I played, my pick was also Codenames: Pictures. See my comments for the Family Game category above for more details. Eric Edens: If Secret Hitler was just names something less volatile I think it would have won. It is a great mechanic but unfortunately it will only be a hit with the crowd willing to play it. Michael W: I’ve had a blast playing both Secret Hitler and Capt. Sonar; less so with Codenames PIctures. To Eric’s point, a massive merchandising opportunity was missed by not making it Secret Palpatine instead. Larry: I’m not a member of the print & play contingent, so no opinions here. Greg S: Print ‘n Play? Never. Matt C: I like to see the winners in this category every year. If it isn’t too card-heavy I print out the winner but then never get around to actually playing it. Craig M: There are too many published games that I miss so print ‘n play is way off the radar. Craig V: No time to print and play this year! Eric Edens: I don’t print either. Chris Wray: Fully agree with the tendency to not do print-and-play here. Larry: Similarly, I hardly ever do solo gaming, so I have little to say. Members of my group tell me that Terraforming Mars is excellent solo. Matt C: Solo gaming? Isn’t that what tablets and computers are for? Craig M: I don’t play solo games all that often. If there was wider access to Colonists, then I’m hard pressed to explain why it doesn’t win. Lorna: I don’t usually play solo games and if I do they tend to be shorter fillers. My fav this year is Mr. Cabbagehead’s Garden. Craig V: No time for solo games this year either! Nathan B: Books are nice solo activities. Movies, crossword puzzles, video games, hikes…do we really need to play board games alone? Whatever floats your boat, I suppose. Eric Edens: Unlike my friends here I play solo a lot. My collection of owned games is almost exclusively games that can be played solo. That being said I never got a chance to try Scythe solo. I liked my time with Terraforming Mars solo the most this year but found Harry Potter Hogwarts Battle (a game not technically 1 player on the box) to be one I’d like to see on the list. Chris Wray: I’m so confused… where is a Feast for Odin? Larry: This is always the category that is of the greatest interest to me and I have to say I was pretty happy with the nominees this year. There are five 2016 games that have really stood out for me and I was very pleased to see that all of them got mentioned. They are Lorenzo il Magnifico (my current game of the year), GWT (also brilliant), Odin, Terraforming Mars, and Oracle of Delphi.. First Class and The Colonists are also in my top 10, Railroad Revolution was until we convinced ourselves that the WU strategy is dominant (we hope the proposed fix helps), and Scythe just missed, so I was definitely onboard with this list. It would have been nice if Great Western had finished a bit higher, but I’m still glad it made the top 3. This is a very clever and multi-faceted game. I love the movement mechanic (someone described it as “roll and move without the roll”) and the way that one newly constructed building can change everything. So many interesting decisions. We’ve seen lots of different approaches work, so I feel it’s well balanced. My one complaint is with the duration; I try to avoid it with 4 players and even with 3, it can run a bit long (but it’s time very well spent!). In fact, that’s the main reason I rate Lorenzo slightly higher; even though GWT is probably the deeper game, I enjoy Lorenzo just as much and you can easily finish the 4-player game in 2 hours or less. Greg S: I have not played Lorenzo or The Colonists, but of all of the others mentioned, my nod would definitely go to Railroad Revolution. Fascinating game with lots of potential paths to pursue. It really isn’t difficult to learn, but gives players tons of decisions and options for clever play. I’m not upset that Terraforming Mars won, as it is a solid game. Craig M: Boy are there a lot of games from late in the year that feel vastly under represented. I’m with Dale, the Colonists deserves this award more than any of the other options. Craig V: Broken record here as I didn’t play any of the top picks in this category either. I didn’t really have a firm pick out of the nominated options, but was leaning toward Lorenzo il Magnifico or The Colonists (just too epic though!). Eric Edens: I need to play Colonists as I feel it will be a top game for me. But out of these three I would have had Mars on top and Scythe second. I haven’t played a game of Great Western Trail that I loved but I want to keep playing it. Feast For Odin was a big game this year too but it has left a bad taste in my mouth each time I play it. So for me the winner is Terraforming Mars without question. Chris Wray: I probably would have gone with Terraforming Mars, Great Western Trail, or Lorenzo il Magnifico. But I think a Feast for Odin or The Colonists deserved a shot here. Larry: Of the few thematic games I’ve played from 2016 (strategy games are much more in my wheelhouse), Scythe was the best. I also enjoyed Captain Sonar. Matt C: It’s easy to call a Star Wars game “thematic” if you’re a fan. I would second Larry’s comment on Captain Sonar – the game does somehow recreate the feeling of a submarine battle. I’d have put up Star Trek: Panic somewhere up there. Defending the ship, rotating the shields, fighting off enemy ships… all the meat and potatoes of Star Trek themes (the original Star Trek anyway.). Eric Edens: I think Mansions should have won this but I also think it “cheated”. Theme is unquestionable when you have a soundtrack, storyline, voice acting, and interactive puzzles. I mean I know Scythe was a good game but tell me you didn’t feel “immersed” in Mansions. Chris Wray: Gotta be honest: I’ve never figured out what is meant by Thematic Games on BGG. Like podcaster Mark Johnson, I roughly equate it with AMeritrash. IN which case Star Wars Rebellion ought to have won. I do give Stonemaier props for clever — and fun — theming on Scythe. I’m glad they won this category. Larry: As usual, no wargames for me last year. Nathan B: Have played none of these, but the next war game I try to sell will definitely have a colon in the title. Mark Jackson: The Twilight Struggle app is clean, has great UI, and even does the math for you. Fantastic choice! Matt C: I’ve played Patchwork and liked it, it has a very clean interface and plays well. I have to give a nod to Twilight Struggle as it is a great port of a very complex game. However, as with many very deep games ported to tablets, the depth of the game can overwhelm the mode of play. 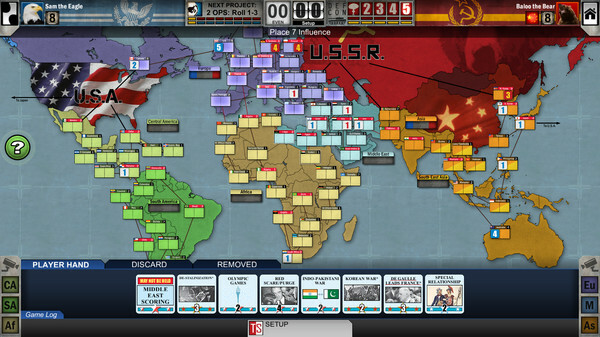 Unless a player is already very familiar with the boardgame, apps like Twilight Struggle can be hard to follow as so many little things are happening at once. It certainly is great to be able to play without a large set-up time and handholding with the math, but I don’t get anywhere near the feeling of an epic arc of history like I do when playing the physical game. While I am glad to see heavy boardgames get ported over to an app, they can suffer from too much information and not enough ways to easily “keep it in your head.” Look at Brass and (to a lesser extent) Steam or Glass Roads. Both are nice ports and save huge amounts of setup time, but since I’ve only played Brass a few times (some time ago) it was very difficult for me to get to the point where I felt like I was playing the game and had some sort of strategy. Another example would be Glass Road. It isn’t all that complex but I had a terrible time learning how to play it on the app since I had never played (or seen it played) before. Larry: I haven’t played either the Twilight Struggle or Mansions of Madness app. I agree with Matt: it can be very hard to play a more complex game on a tablet unless you’re very familiar with it. Besides, they usually take more time than I’m willing to devote to them. Patchwork is indeed very well and intuitively implemented. The AI is good enough to supply a reasonably competitive opponent, although it’s only beaten me once, so some improvements there would be welcome. My favorite of the nominated apps was Baseball Highlights 2045. This is excellently ported and plays very smoothly. The AI is also quite good, although it’s not quite good enough to actually win (even though many of my World Series have come down to a seventh game). I understand they’re working on improving it; I’ll be most interested to see how that works. I also enjoyed the All Creatures Big and Small Agricola port and had some fun with Paperback. For once I’m in the majority; I love Scythe and it was probably my favorite game of last year. It was an instant must-buy and my enjoyment has not gone down with subsequent playings. I do also really like Great Western Trail as well. I was extremely underwhelmed with Lorenzo il Magnifico though, it felt unpolished and clunky and just not enough fun for the time commitment. First Class and Colony are other recent favorites. I haven’t yet had a chance to play Terraforming Mars unfortunately. Anye, my first game of Lorenzo was a bumpy one and I wasn’t sure I’d wind up liking it. But after a couple more plays, it rose to my personal Game of the Year. So you might want to give it a second chance, unless you think it’s just not the kind of thing you go for. What I usually tell people is if you liked Grand Austria Hotel or Voyages of Marco Polo, you’ll probably like Lorenzo; not surprisingly, since they all share the same designers. Thanks to everyone for these opinions, I appreciate the time and thought you all put into them. For me, the highlights of the year have been Terraforming Mars and The Colonists. TM is great, if you shy away from it because you hear that there are “take that” cards/actions, don’t. Those actions are more like pin pricks, temporary bumps easily overwhelmed by the engine you are building. A few other games need further play: A Feast for Odin, Scythe, Great Western Trail, all undecided on because I have only logged one play. I would have missed the Golden Geeks if it weren’t for this article. Greg’s comments about Best Game really match mine. I’ve noticed how the make up of BGG users is diluting the pool of “Eurogamers” and these awards reflect that. I expect this to also change the output of publishers, too. I’ve watched every Star Wars movie but I haven’t really enjoyed them since I was a kid. Playing the games doesn’t interest me. And I own Terraforming Mars, but I’ve only played it once and I don’t feel an urge to play it again. But I owe it to myself to play it one more time before selling it. Thanks for a fun article! I think I value the OG Awards more than BGG’s. I could easily comment on every category, but I don’t want to write a novel so I will just post my thoughts on two of them for now. “I hate Vast with the searing hate of a thousand suns. Honestly, my one (and ONLY) play of it was one of my worst game experiences of the past 10 years.” Tell us what you really think, Larry, don’t mince words. I mean, calm down, it’s called Vast, not Letter of Marque… :) Vast’s asynchronous setup, separate asynchronous rulesets for each player, and disparate victory conditions that each player is working toward (spread across 2 to 5 unique roles) makes it very challenging to teach and play. You must learn 5 different sets of rules to understand how your character interacts with the others if you want to formulate a workable plan for victory. And it is a fantastic game, and gets my vote for Innovative Game of the Year. However, it could be argued it is not innovative, as none of the individual game mechanics are that unusual. But putting them all together this way, and getting it to all work together, that’s innovative. The Mansion of Madness app, which is a helper app for new Mansions of Madness 2nd Edition board game, is the only one on the list of nominees that is not a digital port of the physical game. It almost seems like it should have been in a separate category. Mansions of Madness 2nd Edition is a far better game then the 1st edition because of the introduction of the helper app for the new edition. The app facilitates super fast setup of the board game and each scenario has greater replayability since the app can randomize events and outcomes using a constantly updatable collection. (not to mention that you also get narration and music to make an already very theme rich game even richer). The Mansions of Madness, 2nd Edition app is my pick for Boardgame App of the Year.